Pssssst! We have a dirty little secret! We’ve been without a maid in Mumbai for the better part of a month. When I mention that to anyone who lives here… or has lived here… they are aghast! It is unimaginable that one survives without ‘help’. Truth be told, it made us realise how lazy we’d become. The bed would be left rumpled and crumbled with pillows tossed all over. The dishes would pile up in the sink. Now we just do it before even giving it much thought. However, I have an admission. The breaking point was the floors. We can be democratic about the dishes. Dusting even. Watering plants. We know he’s helpless in the kitchen with cooking and equally so with laundry. But he more than makes up for it in other ways. You see.. my partner is a self-confessed ‘compulsive cleaner’. Which means when the mood strikes, watch out! I’ve never seen my 20-year-old toaster oven shine until he got his hands on it! However… the floors… the sweeping and swabbing… that’s the killer. So after a couple of weeks, we found a solution. Borrow help twice a week for under an hour just to do the floors. That’s it. Now don’t get me wrong. We are still looking for reliable reasonable help. As soon as either of us gets into a manic schedule, our present state of domestic bliss will be shattered. Until you live here, you cannot comprehend the extreme level of dust ‘n dirt and how much accumulates in a single day! Or the delightful, amusing, sometime exasperating symbiotic relationship between ‘helper’ and ‘helped’. PS. Just because it seems oddly appropriate… Here is a little Winnipeg Punk flashback with Propagandhi‘s “How to clean everything”. It was shared today by a Bandra buddy in response to ABCD vs CBAD “You don’t belong here!” with a comment that made me grin ear to ear! Who keeps the house clean? By Carissa Hickling in Every day, Work on April 5, 2015 . Get an IRobot Braava. It’s an automatic sweeper/mop. 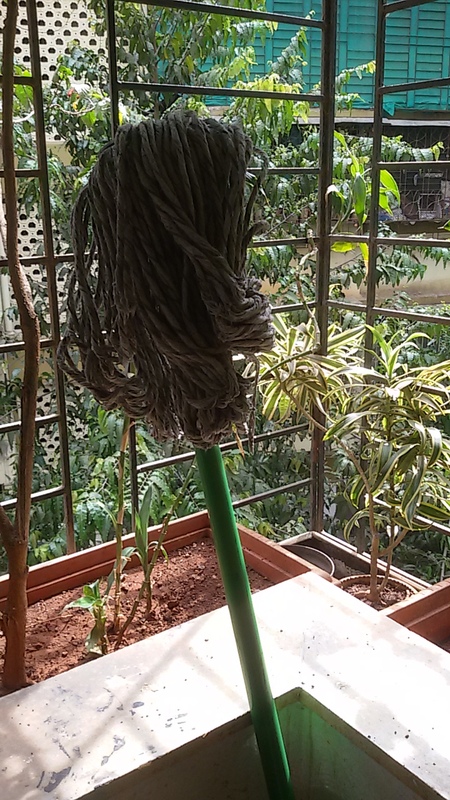 We use it on the days the maid doesn’t come to get mop the dust. A genius invention. My father in law is a compulsive cleaner…in very extreme ways! Everyday after he comes home from work in the late afternoon he cleans for nearly three hours the entire small apartment and everything he does three time. However I’m happy to hear my partner is not alone in the compulsive quality to his cleaning. He certainly would NOT do three hours though. It is more a ‘when the mood strikes’ and focused typically on one item. In China it is also very common to have a cleaning lady (called ayi), but she only comes a few hours one or two days a week, depending on your needs. Well, I guess expat families with kids have ayi full time. We have an ayi in the Suzhou apartment now because we don’t want to spend our weekends cleaning! We also have ‘ayahs’ in India which are the ladies who help with childcare and housekeeping. Wonder if there is a linguistic connect between ‘ayi’ and ‘ayah’?? Uhm I am not sure… in Chinese ayi literally means “aunt”, it is how you call any woman who is more or less the same age as your mother. Not all cleaning ladies are middle aged women, but the word ayi is still used! It’s a house, albeit small. We’ve got up at 5.30 and seen her hanging out the washing and she’s already mopped out. Never marry a Spanish man! 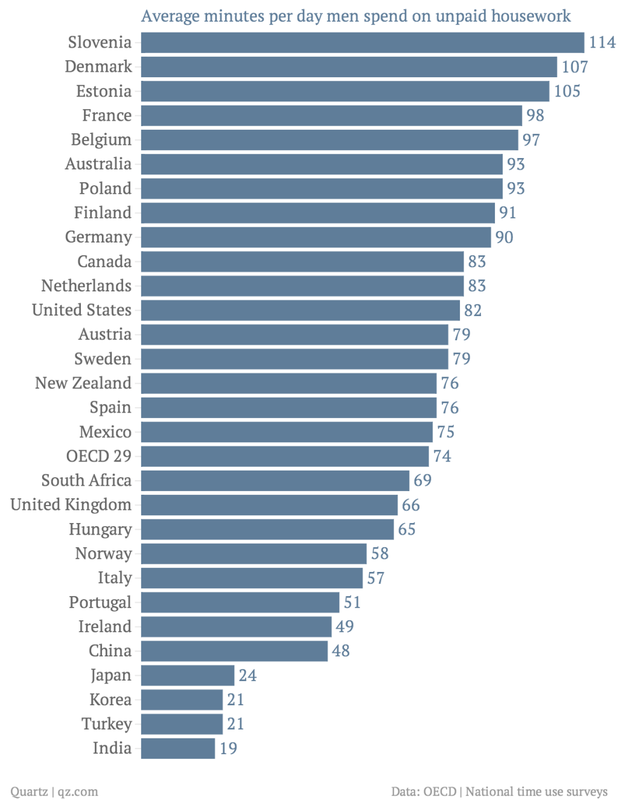 However if reports are to be believed, Spanish men do on average 76 mins of housework per day. Compared to 19 mins for your average Indian guy and nearly 2 hours / day from dudes in Slovenia! That’s great. Is there an equivalent list for how much women do? I have totally grown to love having a maid come in once a week! I have had a maid for the past four years and don’t want to go back to being Maidless. Congrats to you for chosing to go without a maid though! Oh don’t get me wrong – I truly sincerely appreciate having help! 😉 It is just surprising how we are managing so well without. I will likely get a ‘deep cleaning’ service to come in two weeks for all the crazy corners we don’t manage (and a regular maid wouldn’t either! )… but for now we are doing ok.